Workplace Safety in the Food Service Industry is one of a series of Culinary Arts books developed to support the training of students and apprentices in BC’s foodservice and hospitality industry. Your health and well-being are your most valuable possessions. Many laws and regulations exist to ensure employee safety, yet every year thousands of serious injuries occur. In many cases, these injuries have serious long-term consequences for both employees and employers. 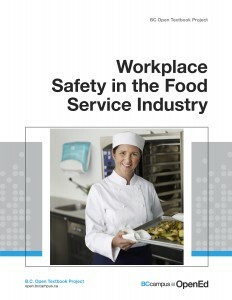 For those new to the workforce, or working in the foodservice industry for the first time, having a solid understanding of both the rights and responsibilities of the employer and employee and training in how to operate safely in the workplace are the keys to minimizing the risk of a workplace injury. The text was authored by the BC Cook Articulation Committee and go2HR and is released with a CC-BY open license.